Don’t think you will find better than Brambley Cottage. My daughter loves going and gets on well with the staff. Brambley Cottage is an amazing nursery. My son loves the staff and the other children. The nursery is clean, the staff are amazing with the children, huge variety in activities. He eats everything they give him and is always coming home with something he’s made. 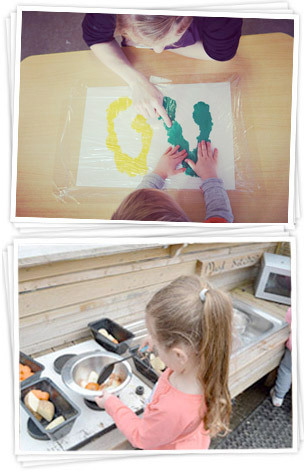 I’d recommend Brambley Cottage to anyone who’s looking for a nursery. I tried a few nurseries before Brambley Cottage and just knew this was the one for my little boy it’s so warm and welcoming and all the staff are fantastic!! My little boy was very shy and not confident and had a real mess phobia which even affected what food he ate before he started here and since he started he’s come on leaps and bounds! It’s amazing to see him learning (and eating!) something new every week! Can’t recommend this nursery enough! I wouldn’t leave my daughter anywhere else and I’m so happy I found this nursery, all the staff are fantastic and really listen to you, always looking to improve even though it’s pretty perfect in my opinion.